Gustave Coquiot, Paris (before the 1930s). R. Huyghe, Cézanne, Paris, 1957 (illustrated p. 30). 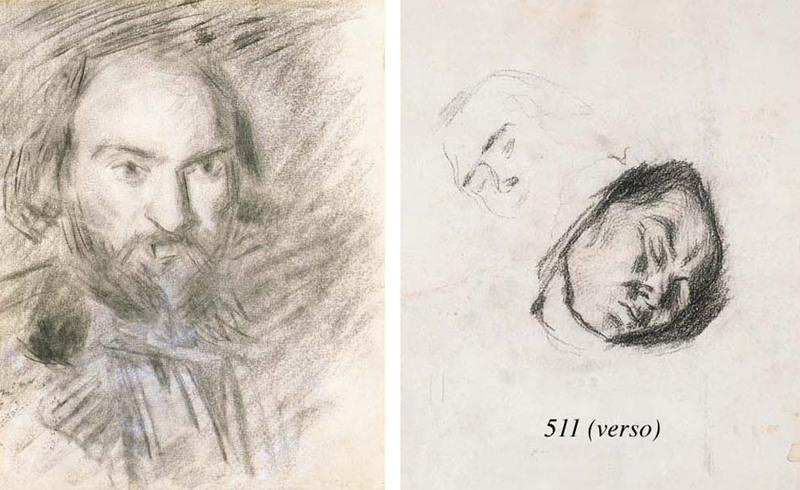 W. Andersen, Cézanne's Portrait Drawings, Cambridge, 1970, no. 1 (illustrated p. 48). A. Chappuis, The Drawings of Paul Cézanne, New York, 1973, no. 401, vol. I, p. 132 (illustrated vol. II, p. 400). Published by Chappuis in 1973 (op. cit.) as being in the collection of an 'unknown owner' - thence presented with a note which lacked measurements, while ignoring the presence of a sketch on its verso (fig. 1) - this sheet is an important addition to the corpus of the artist's drawings. Drawn circa 1875, the work belongs to a series of intense selfportraits (C. 399-407) executed between 1875 and 1884, when Cézanne experimented with new graphic techniques, associating thin pencils to rich charcoals and using a diverse set of tinted papers. In the present drawing the artist combined subtle sfumato effects - achieved by stumping the charcoal, most probably with his fingers - and vigourous strokes of an almost oily fusain, which defines the thick contours of his most expressive face. Five of the most important drawings of this series (C. 399-403), of which the present work is included, show the full frontal portrait of the maître aixois not as a painter (it was not until the 1880s that a 'working cap' or an easel and palette were introduced to identify him), 'but rather as a cross between a bourgeois and a peasant, decked out in a black or brown jacket' (H. Loyrette, exh. cat., Cézanne, Philadelphia and Paris, 1996, p. 146). In all of these works, the composition pivots about the powerful, extremely captivating gaze of the artist. It is exactly this feature that characterises his contemporary self-portraits in oil, three of which are particularly close to the present composition: Autoportrait (R. 182, circa 1875, Musée d'Orsay, Paris, fig. 2), Autoportrait sur fonds rose (R. 274, circa 1875, Private Collection, Paris), and Autoportrait (R. 383, circa 1877, The Phillips Collection, Washington, D.C.). As early as 1907, Rainer Maria Rilke, commenting upon Autoportrait sur fonds rose, seen at the Salon d'Automne, wrote to his wife: 'It is a man gazing at us, twisted a quarter turn from right profile. His thick, dark hair is bunched together at the back of his head and stops above the ears in such a way that the whole line of his cranium is exposed; it is drawn with eminent assurance, hard and yet rounded, from the temple downward in a single stroke, and its strength is apparent even in those spots where, broken up into shapes and planes, it becomes only the outermost of a thousand contours. The powerful structure of his skull, formed as though by hammering from within, is again apparent in the ridges of the brows... the dull stupor of (...) abandon has been replaced by an animal alertness, that maintains in the eyes, unencumbered by lids, a patient, detached wakefulness' (23 October 1907, Briefe über Cézanne, ed. Clara Rilke, Frankfurt, 1952, pp. 40-41). This drawing powerfully conveys the same 'animal alertness' that startled the German poet at the beginning of the century. Finally, this sheet has a very distinguished provenance: its first owner was the writer and art critic Gustave Coquiot, who famously reported on the 1899 exhibition organised by Ambroise Vollard, and dedicated to Cézanne a monographic study a decade after his death (Paul Cézanne, Ollendorf, Paris, 1919).